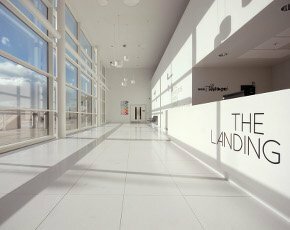 In the gleaming, glass MediaCity UK complex that dominates the waterfront at Salford Quays in Greater Manchester, a raft of small media businesses beaver away in a buzzing startup hub known as The Landing. Here they can rent office space and access state-of-the-art cloud IT services to produce content and provide services for the big broadcasters that have colonised the area, such as the BBC and ITV. Surveying the sleek, minimalist design and high-tech facilities you could be forgiven for thinking this was some Silicon Valley-funded venture. In fact, The Landing is financed by Salford City Council and its cloud services are delivered and run by the council’s IT department from just two modular FlexPod i3 cabinets built on Cisco, NetApp and VMware technology. The FlexPods are running 550 virtual servers that also deliver 99% of the council’s IT services, as well as handling IT services for a number of council joint ventures. Public-sector IT often comes in for a battering, but it’s wrong to assume – as many still do – that council IT is a byword for bad management. IT competence and leadership across the sector varies just as much as it does among private companies. Salford is one of the exemplars, and its performance is up there with that of any well-run private-sector IT department. “We’ve always been well-respected in the organisation – and by our external partners,” says Burt. As well as The Landing, about 25% of council-managed IT workloads are run on behalf of external partners such as its housing and leisure facilities providers. Its FlexPod project won the ‘best private cloud’ accolade at the VMworld Europe 2013 User Awards, but Burt explains the council was already experienced in virtualisation technology, having started its journey almost a decade ago. Yet by 2011 the council’s EMC/VMware platform, based on eight racks of standard Dell servers, was beginning to creak at the edges. Fortunately, it was time for a scheduled refresh. “We were almost out of compute and storage capacity,” says Burt. So after checking out he market, in 2012 Salford appointed leading FlexPod specialist ANS to design and install its new architecture. Working closely with the council’s IT department, Manchester-based ANS deployed two FlexPod i3 cabinets which use Cisco's Unified Computing and Nexus switching, VMware's server and desktop virtualisation and NetApp's intelligent storage and de-duplication. The move increased the council’s server capacity by 50%, freed up 75% of the space in its datacentre and helped Salford City Council reduce its energy bill by more than half. Bar one or two hard-to-migrate legacy systems, the FlexPods now handle all IT services for the council’s 3,500 employees, including its formerly Solaris-based SAP system. “In our previous virtualised environment we couldn’t entertain running SAP because it would have been too much of a drain on resources,” says Burt. Now SAP is virtualised, it is much easier for Salford to upgrade the system and keep up with new functionality that improves the council’s efficiency and productivity. Because of the ease of firing up new virtual servers, and the additional speed and capacity the system brings, Salford City Council has been able to further its private cloud ambitions significantly in the 18 months since the FlexPods were deployed. Initiatives such as The Landing are helping nurture small local companies so that they can grow, which should ultimately boost the council’s tax coffers as well as easing the support burden it faces.